M T D F e b r u a r y 2 0 1 9 40 trucks with trailers attached. e shop can perform work on everything from tires to brakes to welding on trucks and trailers. "From morning until night there's never an empty bay," he says. Over the years Sylvester has grown his commercial truck customer base to roughly 800 fleet accounts, many of which are from out of state. "We have a good, strong local customer base, but my stronger base is out of town," he says. "For example, let's say there's a fleet out of New Jersey and they have 400 trucks and they're servicing an account in the Columbus area and I-90 is on their route. ey'll stop here and we handle whatever their needs are." Typically, the out-of-town fleet's main- tenance manager will email Sylvester's and let them know what work needs to be done as well as what their turnaround time is. at customer goes to the top of the shop's to-do list. 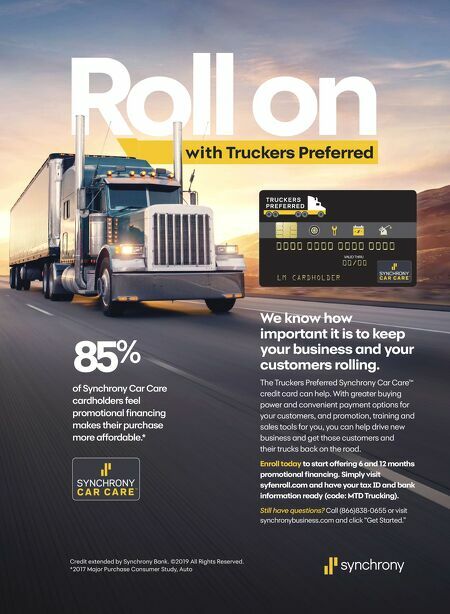 "On the truck side we're focused on fleets and the local business accounts," Sylvester says. "Yes, we have some independent opera- tors that we've had long-standing relationships with, and on the retail side we have a lot of walk-in business and a lot of fleet business." In order to handle its heavy volume of business, Sylvester's is equipped with the latest tools and technology to get the job done quickly and correctly the first time so busy trucks can get back on the road. "Between the Fuso trucks and the heavy truck repair and heavy truck alignment, we have two different alignment racks. We have a full pit for heavy trucks and a medium area for medium trucks. We also have a frame rack for frame straightening, and a fabricating area for truck-related fabrication. We do everything bumper-to-bumper on the trucks. at's what the fleets like." e tire techs are Tire Industry Asso- ciation (TIA) trained, and some techs are factory trained to work on the Fuso line. He also has truck technicians who can handle just about anything that rolls through the garage doors. "It's all about giving them the right tools to perform truck repair," Sylvester says. "Nowadays it doesn't change monthly, it changes daily and we spend the money to keep up with the technology. at is very important. I utilize state-of-the-art equip- ment, computers and diagnostic equipment and my people are all trained." Whether it's a long-haul, regional or mixed service truck, Sylvester's has the right tire. If for some reason a truck can't get to the shop, Sylvester's will come to them. "If that truck is in Toledo (95 miles away) or Akron or Canton and they have issues, we'll send a service truck out and do the repair or tire service," he says. "We go out and perform roadside service for tires, off- road and we do mechanical truck service." ey also have towing capabilities. "We have heavy towing trucks and light trucks for the auto side. We don't advertise the towing, but we utilize it for the customer base that we have," he says. HUMBLE BEGINNINGS ere's a humble sense of pride that emanates from Sylvester when he talks about his early days in the truck tire industry. "My junior and senior year of high school, I played sports, and on the weekends I washed trucks and greased trucks for Leaseway Transportation," he says. "at was my initial insight on the trucking business." He worked his way up from truck washer to tire changer to diesel technician for Lease- way. At the time, Leaseway was one of the largest transportation logistics companies in the world. Sylvester knew he wanted to work in the transportation industry and took a full-time job with Leaseway aer high school. "I was doing some night school at Cleve- land State University, and Leaseway asked me to come on board full-time and I did that," he says. "I worked out of their corporate headquarters in Beachwood, Ohio. I was involved in operations so wherever they needed us, they would send us." Sylvester provided assistance for whatever fleets needed from mechanical issues to tire issues to union issues. "It taught me all of the fundamentals of transportation and logistics and trucks," he says. While things were going well for Syl- vester's career, Leaseway was heading into financial trouble in the late 1980s. "One day they came in and fired the whole department. ey fired the whole company," Sylvester says. Sylvester had several other job offers on the table, but his wife and two teenage daughters were not fans of moving away from home. "ey said, 'We're not moving,' because they were in high school," he says. "So I had one option and that was to start my own business, and that's what I did." Sylvester's first day working for himself entailed a call from a national breakdown system out of the South who dispatched him to put on a truck tire. "And it was the wrong-sized tire," he jokes. "I started off as the only person in the business. 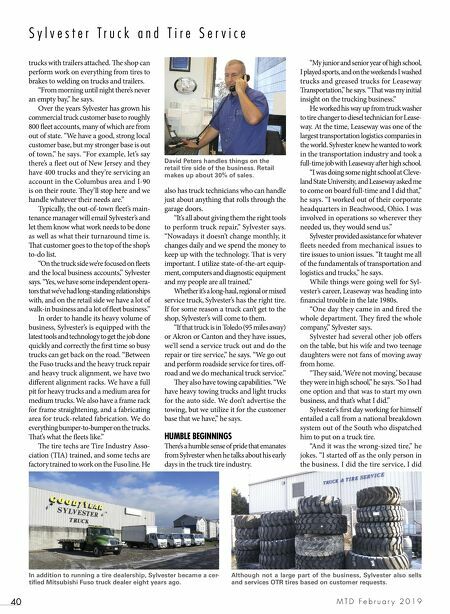 I did the tire service, I did S y l v e s t e r T r u c k a n d T i r e S e r v i c e In addition to running a tire dealership, Sylvester became a cer- tified Mitsubishi Fuso truck dealer eight years ago. Although not a large part of the business, Sylvester also sells and services OTR tires based on customer requests. David Peters handles things on the retail tire side of the business. Retail makes up about 30% of sales.